KAYSVILLE, Utah (AP) — Gov. Gary Herbert is calling on Utah lawmakers to keep tackling issues around Salt Lake City’s homeless shelter and to get the state’s Winter Olympics facilities ready to potentially host the games again. Both are priorities in a $16.7 billion budget plan unveiled by the Republican governor Wednesday at Davis Technical College in Kaysville, chosen to highlight his focus on nontraditional colleges such as technical colleges. Herbert’s plan is a starting point for lawmakers who meet for their annual session in January. They will pass a budget for the governor to later approve. Herbert is calling for lawmakers to spend nearly $6 million to upgrade venues used to host Salt Lake City’s 2002 Winter Olympics, another sign that officials are serious about making a bid for the 2026 or 2030 Winter Games. By comparison, legislators spent $500,000 this year on facility upkeep. The state formed an exploratory committee in October to prepare for a possible new Olympic bid. A state audit found Utah would have to spend about $39 million on upgrades to position Salt Lake City to host the games. That’s in addition to the $1.2 billion to $1.3 billion it would cost to host the Olympics, not including extra federal funds for security. The governor wants to give local school boards $121 million to increase K-12 teacher pay or to spend on professional development, technology and counseling. The state is expecting 7,700 additional students in public schools next year, and Herbert’s budget sets aside $36 million to pay for them. He also has proposed sending an extra $34 million to districts to use on programs for at-risk kids, such as special-needs students. There’s about $33 million in Herbert’s higher education plan to provide a 2 percent pay increase for university and college faculty members and to blunt across-the-board tuition increases at all of Utah’s schools. But individual schools could still impose other tuition increases. He also is asking for $7 million for technical colleges and to fund buildings at Dixie State University ($17 million), Weber State University (about $16 million) and Davis Technical College (about $34 million). The proposal sets aside $10 million for a multiyear effort by the state, Salt Lake County and Salt Lake City to address overcrowding and crime at the city’s downtown homeless shelter. It includes a stepped-up police presence, drug treatment and job-training programs and three new smaller shelters spread out around the city. State officials have said the entire effort is estimated to cost about $67 million, with the state’s share totaling about $11 million. 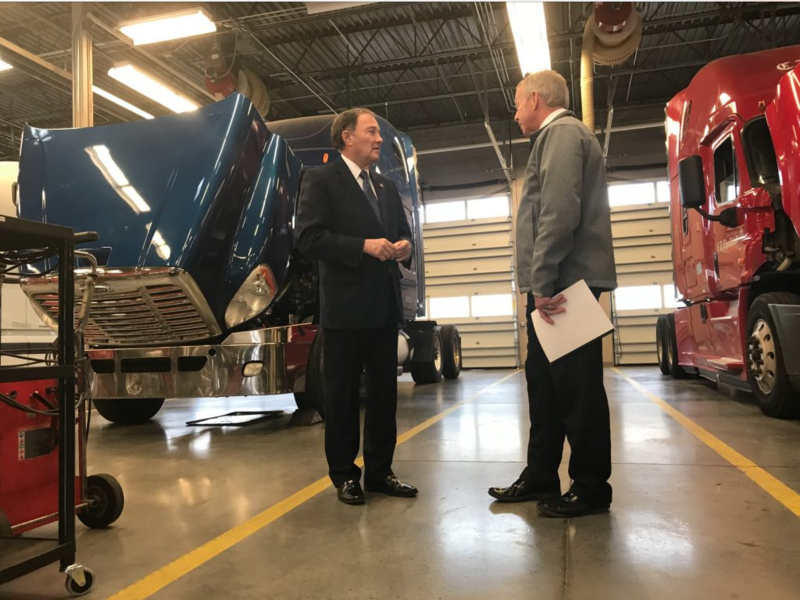 Herbert suggested spending about $2.4 million for a three-year program that would cover the costs of birth control for poor women who aren’t eligible for Medicaid or other government insurance programs. Republican state Rep. Ray Ward has suggested the proposal, saying it could help women and their families climb out of poverty by preventing unwanted pregnancies and would save taxpayer money and prevent abortions. There’s $1 million to study how water is used in agriculture, part of a lengthy effort to determine how much water Utah uses. It comes as the state contemplates some expensive water projects — including the $1 billion Lake Powell Pipeline in southern Utah, which would pull water from Lake Powell and send it to two southwestern counties through nearly 140 miles of underground pipe. Herbert’s plan also calls for spending $8.4 million to upgrade the safety of about a dozen dams statewide. Herbert suggested generally that lawmakers broaden the tax base for sales and income taxes and look at trimming exemptions, exclusions and credits while lowering tax rates. The governor said his plan “has no tax increase proposals,” though it includes a tax hike on e-cigarettes. E-cigarettes face a sales tax rate of about 6.5 to 7 percent. Herbert suggests taxing them like other tobacco products, at a rate of 86 percent. Herbert’s spokesman, Paul Edwards, said the governor believes e-cigarettes should be treated like tobacco and their current tax rate is one of those “exemptions” he wants to target.